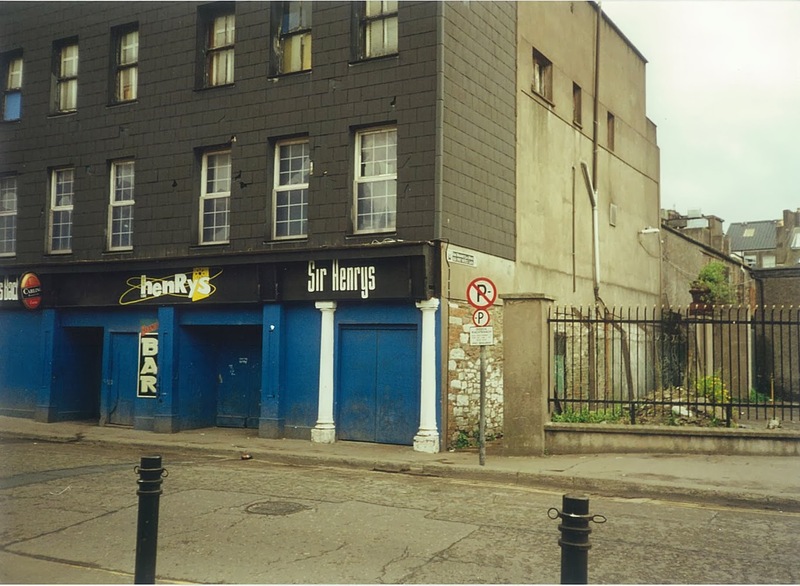 Boole Library, University College Cork, is in the process of curating an exhibition about the Cork nightclub Sir Henrys (1978 - 2003). This exhibition is to take place from July - September 2014 in the exhibition space of the Library and will focus on the 25 years of the clubs existence. Eileen Hogan (UCC Applied Social Studies), DJ / Club promoter Steven Grainger (or Stevie G as he is professionally known) and I are the curators of this exhibition. The exhibition is going to contain artefacts from before the opening of the club up to its very closing. We will also be collecting oral histories from individuals who were in some way connected or involved with the club during its existence. This material is then going to be deposited in the Boole Library's Special Collections as its very own collection. When people hear that we are curating this exhibition their first reaction is almost always an outpouring of nostalgic goodwill - our Twitter page and Facebook page and all the emails we have received from the public offering us material and assistance for the exhibition are strong testament to this. The second response is usually something along the lines of - it's great that an exhibition like this is taking place, and it's even greater that it is taking place in the Boole Library, an academic setting. People seem to like the idea that Sir Henrys is being brought into the academy. This response or reaction is what I would like to reflect on for the rest of this post - why is it so great that a University Library is having this exhibition and what does it mean, if anything, for libraries? I think the reason people find it so great is because we are legitimising something which means so much to them. This might sound like a Grand Statement but that is exactly what we are doing. Eileen, Stevie and I are giving Sir Henrys new worth by curating this exhibition. The Boole Library is adding further validation by hosting it. Specials Collections, Boole Library, are then adding even further legitimacy by their intention to create a collection in their Department from the material donated and collected for the exhibition. They are stating that Sir Henrys and its paraphernalia and memorabilia and oral histories are important enough, special enough, to be curated, collected, catalogued and preserved for future generations of researchers. I believe this is a very big statement we are making. What we are all doing is taking something which up to this moment had no acknowledged academic value. It had cultural, social, musical and nostalgic value. But it had no academic value. It was, after all, just a nightclub - a place people went to socialise, to dance, to meet people, to hang out, to have a drink, to catch a gig or a club night. It had no value outside that which the people using the club put on it. It had a purely subjective value. But with this exhibition what we are doing is legitimising an object. We are creating an academic object where there was none before. We are helping to create an object of study. We are, in essence, giving it an objective value, a value beyond that which it had. It is now a valid object of further study and further research. The exhibition and the Sir Henrys Collection in Special Collections will provide current and future researchers with strong primary data. This collection will be a boon to scholars of, amongst others, youth culture, music, dance culture, identity, subcultures, the use of social and cultural spaces. Sir Henrys the Cork nightclub is now Sir Henrys the object of study. I feel that this is very important for the Boole library because we are setting an agenda here - we are saying this nightclub is worthy of academic research and study. It is worthy of your academic attention. We are being proactive in determining what is important. After all others in the business of education engage in this legitimisation of phenomenon. This is something that we in libraries should be looking at doing more often. Especially in this day of consortiums and shared resources which can lead to almost identikit libraries - we need something that makes us stand out from all our fellow libraries. Our special collections are a prime means of distinguishing ourselves from the horde. It is also important for the Boole library to be collecting this material because it fits in with the College's intention to create better and stronger links with the city. We are strengthening the Town and Gown links. It is, I believe, important for libraries to be collecting and curating their local heritage. If libraries don't do this there is the chance that all this wonderful heritage and culture will be lost. Below is a another set of interesting web seminars that might find a place in your calendar. The topics covered include preparing for disaster recovery, library website (re-)design, open source discovery and online collaboration. This could be a good one. I attended something similar in person back in November of 2012 and developed a disaster recovery plan for our library on the back of what I learnt there. See previous blog post here. With so much on the line, leaders simply cannot afford to overlook the risk disasters pose to their organisations and daily operations. However, simply starting a Disaster Recovery plan can seem overwhelming at first. But it doesn't have to be. This one-hour session addresses some simple ways to build your resilience as an organisation today with minimal commitment of time and resources. If you do nothing else this year to protect your employees, clients, income, and the future of your organisation, these steps should be a top priority. This is going to be very interesting for sure. If this catches your eye, you might as well check out ACRL's College library website of the month. This is an excellent point of call if you're looking for food for thought and design inspiration. Every library needs a website, but what makes a good site? How can you figure out how to most effectively allocate your resources and build a site that fits the needs of your patrons, your staff and your community? In “The Library Website” a panel of experts will look at the dos, should-dos, and dont's of library websites. An introduction to the VuFind open source discovery layer, discussing both the capabilities of the software and the nature of the community that develops and supports it. A brief presentation will be followed by a question and answer session with the project’s lead developer. Simple Surface in an online collaborative tool that allows you to manage tasks and projects, brainstorm ideas online, and visually manipulate a plan for completion. Capture and record ideas visually, share and collaborate, and it’s free. Wondering how librarians are currently gathering student feedback on #infolit instruction? Online/print? & what do you ask for feedback on? From the responses, Google Docs and Surveymonkey are both popular collection tools (does anyone still use paper I wonder? ), with some supplementing this routine post-session data with periodic focus groups or face-to-face feedback sessions to tease out deeper issues. The type of feedback sought typically includes a mixture of different elements including: ranking the usefulness of the sessions, timing of sessions, and suggestions for future topics/workshops. Capturing student contact details also provides a good opportunity for follow-up. I would be interested to hear what others do with the data they collect, that is, how they analyse and present it, what they use it for, and also what they find it useful for. From my own experience, data is sometimes collected as a matter of process or habit, filed away in neat tables in annual reports and other documents (i.e. technically used), but perhaps not fully utilised to support or inform change. How can we use feedback and assessment measures to shape our strategy, build relationships with academic staff, and guide our teaching practice? The first step in this, requires looking at the kind of feedback and information we gather - are we collecting the right information? As many of the sessions I deliver are 'one shot', I feel the scope for running pre- and post- tests is limited (though possible). If the post-test is set immediately after the session, questions are likely to be based largely on recall. There is also arguably too small a window of time for any 'real' learning to have taken place, given that learning (hopefully!) happens over a sustained period of time following the session in a self-directed way. If the test is administered at a point further into the future, other confounding factors will likely be introduced, which may preclude the drawing of any meaningful inferences regarding relationships or causation. To a large extent, I think quantitative measures and tests like Project SAILS are too narrow to fully capture a continuum of competencies like information literacy. Being able to remember the name of a database or the order of elements in a standard citation does not really tell us much about whether a student really understands how to find, evaluate or use information effectively. At best, it is an isolated snapshot of a moment in time, which again can be potentially influenced by other variables. The literature (Gross & Latham have a recent study on this) shows that students' self-assessments and views of their abilities are often very different from the reality. Consequently asking students to rate their confidence or ability after a session is likely to overstate actual levels in many cases. Using student satisfaction measures will tell us little, if anything, about learning and may be biased by students' perceptions of an instructor's personality, the complexity or difficulty of the material covered during the session or other factors.